Five of Wands card means that soon you’ll have to solve a complex problem or make a difficult decision, or else it will be impossible for any further personal development. This card isn’t very positive and suggests that fate will throw you challenges and there is a possibility you’ll have to face serious changes, which you will have to fight or learn to adapt. There may be conflicts and even losses. However, the Five of Wands is encouraging by the fact that if you pass all the tests on your journey, then you will have an unprecedented burst of energy, creative enthusiasm, spiritual growth and transition to a higher stage of development. In any spread Five of Wands card is a kind of a warning that in order to get something new and desirable the person has to give up on something old and already available. The interpretation of this card is also strongly influenced by the accompanying Major Arcana cards. Gaining life experience – living the lessons and the situations, which make the experience. 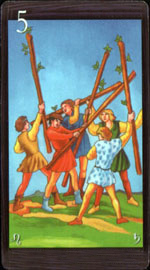 Five of Wands card requires from you power of will and determination of thought. The card can serve as an indicator that you are paying too much attention to a particular area of business. Additional Card Meanings: Imitation, new horizons. Injustice, cold and hard mind, inability and unwillingness to benefit from lessons of life, perfectionism, separation of everything to black and white regardless of any logic of events, viewing the events without their context. Sometimes it points to a risk of becoming a victim of intrigue in a near future. Reversed Five of Wands card may also mean a tragic love in a near future. Such love might be not only unrequited, but also tragic for the person who performs the divination. In some cases it may point to an illegal kind of love. Don’t be afraid to compete against others, even in a new area. Ambition must not turn into impudence, and skills into showing off. Today you have to be in shape because you have to prove your skills. This is a normal situation of examination or testing, which you shouldn’t avoid. It doesn’t matter whether it is a competition with rivals, a confrontation between two opinions or a psychological conflict with a close friend – you have to “take the bull by its horns” and prove that you’re still on top of things. If you’ll lead the fight with honesty and put your 100% into it, then you are guaranteed a victory. Even if you’ll get a second place, you’ll still be satisfied with the fact that you participated in this struggle.